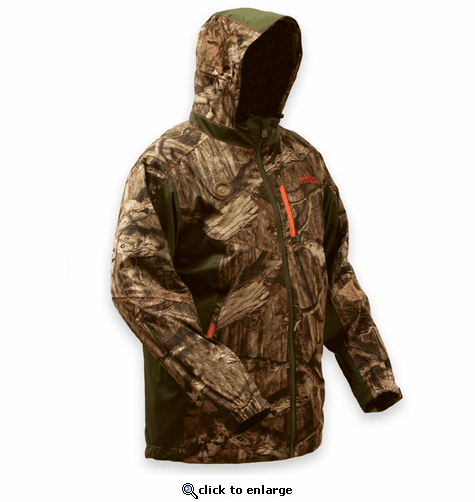 Stay warm in the field in the My Core Heated Gear Men’s Heated Lite Rain Parka, which is made of 100% windproof polyester for protection against the elements. My Core Control™ Personal Thermal Control Technology offers 3 levels of adjustable heat to help you stay toasty for up to 12 hours. Mossy Oak Break-Up Infinity camo pattern. About MyCore Control Heating Technology: Electronic Personal Thermal Control Technology means having control over your core body temperature. We don’t like heating sensations, we like real change you can feel and see with a thermometer— that’s our difference. We don’t want our customers to feel warm, we want them to be warm. We are not warming your chest, your neck, your back or any other area most commonly used by traditional heated gear. Sure, heating these areas can make someone feel warm, but are you really warm if your temperature doesn’t change? There are only two areas on the human body that when heat is applied can produce a change in core body temperature: the pulse point areas on your inner wrists and your inner ankles. Currently, our patented technology takes advantage of your inner wrists and gently warms the blood as it passes through. This blood is circulated back to your heart and is then pumped throughout your entire body from head to toe. We are effectively making you warm from the inside out. 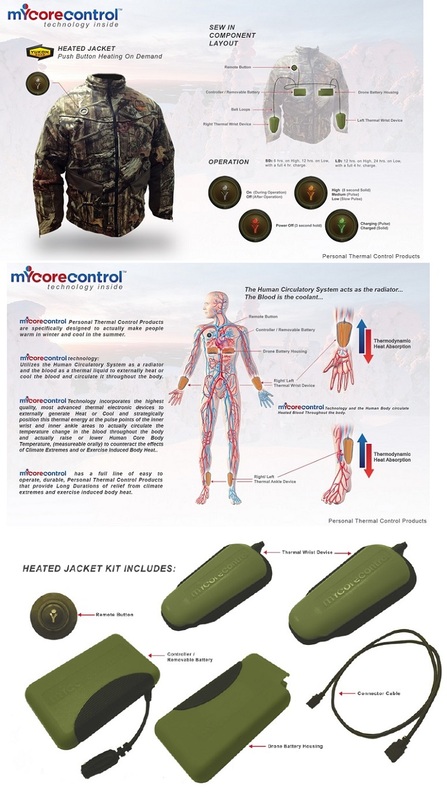 My Core Control, Inc. is a Houston, Texas based company, established to bring "Personal Thermal Control Products" into existence and then to market these revolutionary products as a whole new category of merchandise. Personal Thermal Control Products are sold into a broad number of different, well developed existing markets, while providing consumers with a simple to use, photo electronic, chargeable device that will better manage the negative effects of climate extremes, exercise induced body heat or realize other benefits associated with raising or lowering human core body temperature. When worn as a wrist band accessory, sewn into apparel or incorporated into industrial gear, "Personal Thermal Control Products" have the ability to raise human core temperature on demand with the simple push of a button. While currently introducing our patented "Heated Personal Gear" to the market, we are also in the final stages of releasing next generation products including: Thermal Control Modules that regulate heat and cool, accessory wrist devices that are independent of outerwear, solar powered gear, bluetooth and WiFi capable technologies built directly into personal wear and MUCH MORE!